This SID detector responds to increased ionization in the ionosphere due to solar flares during daylight hours. Plots include data from yesterday and today. 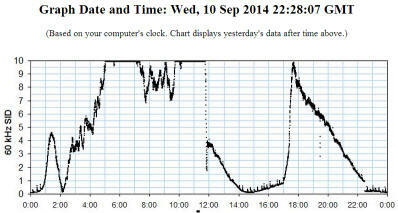 Check the time (select UTC, 24-hr) to see where the new data is being recorded. There is usually a noticeable discontinuity where the new data ends and the old data remains. Two red traces indicate that I had to restart the computer and one of the traces will clear in a day. The black trace is either unused or serving a special purpose. 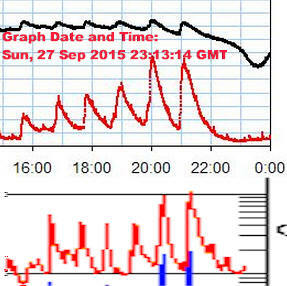 The useful portion of the SID curve lengthens in summer giving up to 10 hours of monitoring. In January there's only a few hours of good sensitivity. The plot is from the newer Oddball Sid Receiver using a loopstick antenna. 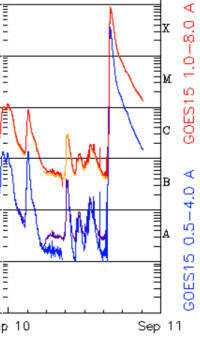 SIDs will cause spikes between about 12:00 and 0:00, where the plot is normally low. The high portion between 0:00 and 12:00 is nighttime sky wave. The width of the useful SID window is a function of the season, being longer in the summer. 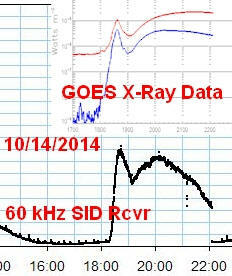 To confirm a flare, see http://www.swpc.noaa.gov/products/goes-x-ray-flux . 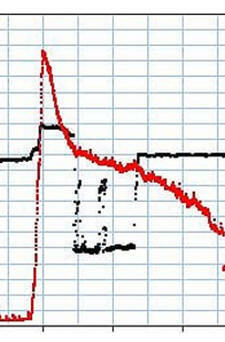 If the red trace drops to zero suddenly WWVB may have gone off the air; Check the NIST website to confirm. These SID charts are only useful for detecting flares during the daylight hours. Below is a plot made on 10/25/2013, ending at 23:00. 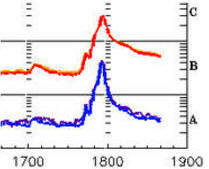 The plot between about 22:00 and the next day at about 12:00 is reflection from the higher ionospheric region (F layer). 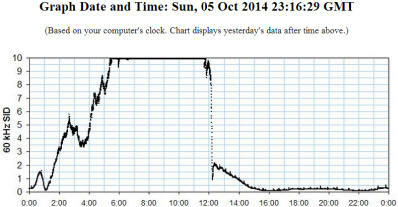 The lower-loss reflection yields a strong signal and is why clocks and watches using WWVB usually calibrate at night. 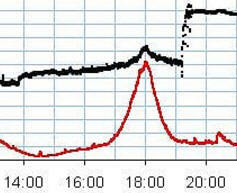 Note the signal actually drops before it rises in the fall during a flare, winter and early spring here in Austin. That usually doesn't happen during the warmer months as the lower C layer is sufficiently ionized to be slightly reflective without a flare. Lots of "area under the curve!" reached maximum 10 minutes past 18:00. Here's a weird series of flares 1 hour apart. The bottom is NOAA data. This powerful X-class flare reached for the top of my plot! 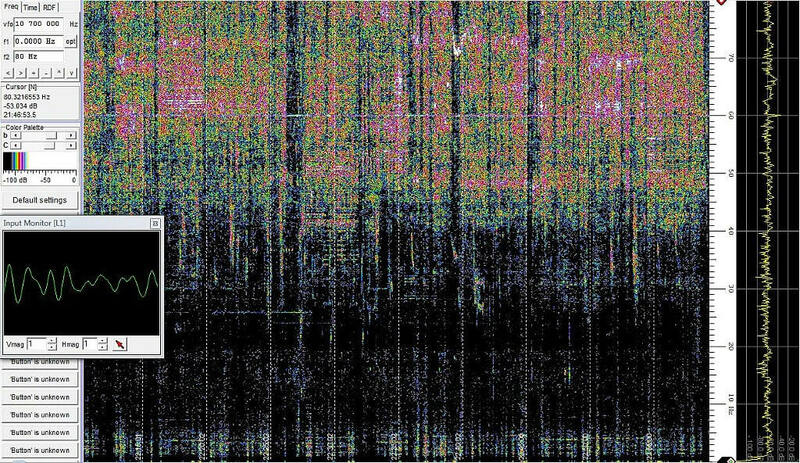 This spectrogram updated every 5 minutes (hold shift and click refresh). It displays 0 to 90 Hz (unless power fails and it defaults to 60 Hz). The vertical dotted lines are 5 minutes apart. This is my front yard microphone with the transistor preamplier (the back yard mic. was destroyed by water). The amplifier boosts the sensitivity below 10 Hz giving a useful response to below 1 Hz. Previously I've seen thunder before it could be heard but nearby highway construction cast doubt. This is clearly the hurricane! When I first saw this low-frequency noise on the spectrum it was quiet outside, at least to my ears. Look at those bass notes at the bottom! You can see the harmonics from the thumping. Believe me, it's thumping but the part one can hear is further up the spectrum.